Ayoush, originally uploaded by jaxies. I would like to preface this post by saying it’s a miracle that any of these photos are in focus because not only was it incredibly dark when I was taking them (and I have terrible eyesight, to boot), but I was drunk. There. I said it. Sorry. I know, I should be a beacon of moral fibre, I should get my business done and leave the drunkenness to afterwards, but I didn’t. I’m not. Oh well. My girl friends and I decided to go for dinner together for a catch-up/bonding session. Two boyfriends were brought along as well, which is always dangerous (for them) as when we girls get together we pretty much regress back to the age of thirteen. It’s really rather wonderful. For fear of being late I got there very early, was the first person in the entire downstairs of the restaurant (very embarrassing, they turned the music on just for me, but made the comment, “what, just for one lady? !” when the hostess told them to do so, and I then hid behind a newspaper in a very dark and very large booth/cave (seriously, I can’t quite describe just how huge these booths are), waiting for my friends), and then, as I felt so incredibly awkward, managed to down an entire large glass of pinot grigio in about ten minutes. Whoops. 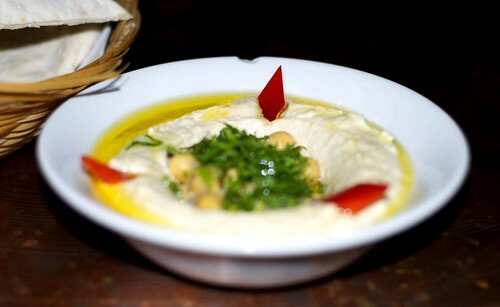 Anyway, despite all that, Ayoush is actually a very decent restaurant, and plenty of fun. I was maybe a bit of a killjoy as I’d come straight from work and was pretty exhausted, but I still had a good time with my girls and the food was a surprising treat. 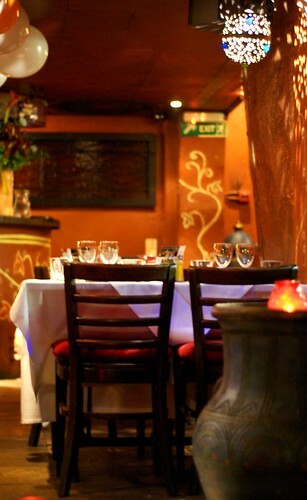 Ayoush is a North African restaurant located in central London, two minutes away from Bond Street tube station. It’s just up the road from the hustle and bustle of Oxford Street and the ever-popular St. Christopher’s Square, and yet once inside you somehow manage to forget that you’re in one of the busiest parts of London. You may even be fooled into thinking you are, in fact, in Morocco. Well. Almost. Whilst we were waiting for the others we shared some pitta bread, hummus and the wonderfully named Cheese Nuts. No photo of the Cheese Nuts as, although I did take one, when I looked back on it sober I realised it was horribly out of focus. Into the bin with that one. They were, however, very tasty and consisted of golden deep fried feta cheese with nuts and bread crumbs. The hummus, too, was very tasty – rather garlicky but on the plus side I was keeping the vampires away… You may notice the photo of the hummus looks slightly bizarre. Wine + cocktail + Jackie = keraaazy photos. Next up three different types of samboussek (only two pictured here) – spinach and feta, parsley and feta, and lamb and herb. 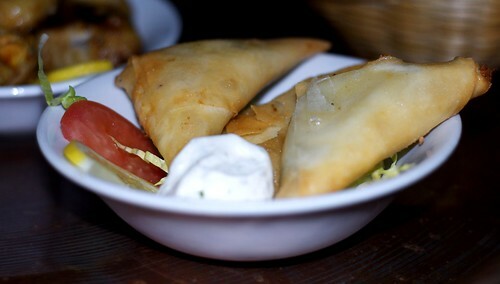 Samboussek are basically deep-fried filo parcels, very similar to Greek spanakopita mini parcels. Super tasty – we were all a big fan of the spinach and feta and ordered some more a little later. I loved their Baba Gannough. Absolutely loved it. It was topped with mint and pomegranate, and the sweetness from the pomegranate complimented the garlicky baba gannough perfectly. So delicious – I mopped up the last of it with my pitta bread, barely sharing with the other girls! 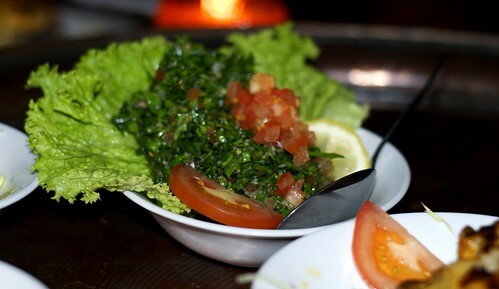 Next to arrive, tabbouleh. Whilst rather refreshing, I found this a little too bland for my tastes. Maybe I was just too busy trying to hide the baba gannough from the others? Finally we had the mixed grill, which consists of skewers of grilled lamb cubes, kofta and chicken with onions and green peppers, marinated in a garlic herb sauce, served with rice with almonds and raisins. To be honest, I was more a fan of the rice than the rest of the dish. The meat was a little dry and, well, boring, but the rice was beautiful. I may try to recreate it soon… no photo – sorry! By this time was far too hungry! All-in-all the food was pretty good. Cocktails were particularly tasty (if a little on the pricey side) and service was decent. And did I mention the belly dancing? Oh-ho-ho. The belly dancing. Just as we were finishing up our meal there came a great deal of whooping and cheering, and suddenly before us was a scantily-clad girl with the most wonderfully long hair, rolling around with a cheeky smile on her face. She danced by herself for a while, then started encouraging other diners to get up and join her. At first not many did, but the table in the booth/cave next to us were a group of young-ish girls, all apparently professional dancers and very eager to strut their stuff, so up they got to join in, and soon the music was pumping, there were girls shaking their hair all over the shop and a man with an African drum had mysteriously appeared next to the bar, playing along energetically. I’m sure if I hadn’t had to work the next day I would’ve joined in too, but sadly an 8am start dictated that I had to pay and leave my girl friends to it, boyfriends looking on with somewhat bemused expressions on their face (at one point, after a particularly energetic discussion between us girls, one of the boys leaned over to the other and said, “do you sometimes get the impression that they forget we’re here?”). Overall a fun evening out, and at about £30 per head (including a glass of wine and a very large cocktail, and very decent amount of food) pretty good value for your money. Shkr? 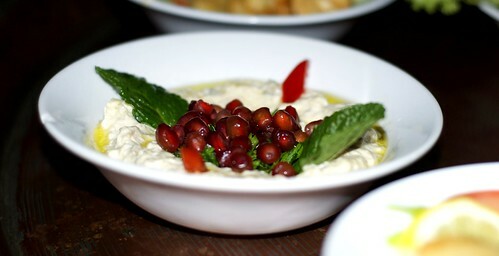 Ayoush, or as we more commonly say in good ol’ blighty – ta very much. That’s all for now, folks. More exciting stuff coming over the next few days so watch this space. Until then, peace and love. Ah, didn't know North African food was so close to Turkish food…but that makes sense. That Baba Gannough looks amazing! "as when we girls get together we pretty much regress back to the age of thirteen. It's really rather wonderful." YES. I will always love this about us girls. No apologies for it! 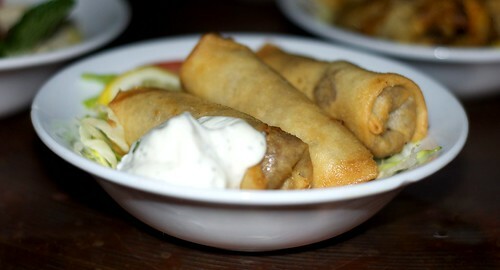 I love North African food…and it sounds like you had a good time with some good drinks too! And I agree, there is nothing more fun then being with girlfriends…such silliness. 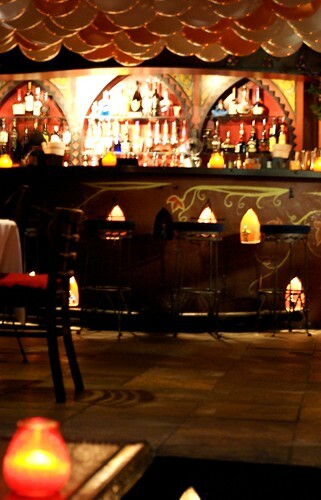 Ash – yeah I actually thought it was a Turkish restaurant, at first! I love my girl friends – they're the best. Reets – I bet you do ;) Come visit me in London and I'll take you there! Monet – it was fun, if only I hadn't had to run away so that I could get up for work the next morning!